Traditional File Drawers: Great for when you want to file quickly and retrieve easily. Accordion Files: This is best for treating papers like files and it’s also portable. Hint: Use this to file monthly receipts. Wall Sorters: Use this to contain mail and sort many files at once. Hint: Use one that can be easily removed when its time to pay bills. Paper Trays: Besides acting as the obvious Inbox/Outbox, adopt this for sorting printer paper and holding filing supplies. Vertical Sorters: Keeps active files at eye level. Also works well for sorting mail. Very versatile. Magazine Files: Great for holding magazines and project files that are still “works in progress”. 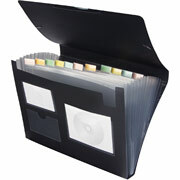 Binders: Best for storing information you use regularly and flip through quickly. Hint: Great for recipes when using clear protective sleeves. Need a product recommendation for a paper organizing project you’re working on? Just send us a message and we’ll help you out! Click here to read more on my blog post about organizing with binders. This entry was written by Elizabeth Bowman, posted on January 18, 2010 at 11:24 am, filed under Business Organizing, Favorite Products, Home Office Organizing, Organizing Process, Organizing Small Spaces, Paper Management, Quick Tips and tagged accordion files, binders, Elizabeth Bowman, file drawers, file organizing, general organizing, Innovatively Organized, magazine file bins, Organizing Process, Paper Management, paper organizing, paper trays, sorting, vertical paper sorters, wall sorters. Bookmark the permalink. Follow any comments here with the RSS feed for this post. Post a comment or leave a trackback: Trackback URL.